An experienced team and solid planning are crucial to successful projects, large and small. While you might consider managing the design and build out of a construction project yourself, you’ll save time and money by hiring a design professional early in the process. They can take a lot of the guesswork out of finding what you really want and how to accomplish your goals. Consulting with an architect can help you decide which concepts are feasible and which aren’t, or where to purchase the best products. Your architect can also help you establish the right team. For instance, you may need an engineer for certain structural concerns, or a carpentry restoration professional if you live in a historic home. Choosing the elements of your remodel that you simply can’t live without, versus those that are flexible, will be a valuable tool as you move forward. You may need to forego certain aspects of your design in order to include other more important features or attain certain scheduling goals. Being clear about your priorities will help your team to keep the project running smoothly and on schedule. It’s important to understand that unexpected complications will happen on almost every construction project. Always be prepared for a project to take a bit longer than you expected and make sure to have a little extra money set aside for surprise expenses. Budgeting about 10% extra will not only prevent you from having to come up with more money on the fly, but will also make it more likely that the project is finished on time. Documentation is critical to managing a construction project. A crystal-clear vision, printed on paper, will mean fewer costly delays—and much less stress—for everyone. While digital is great for envisioning your project, spreadsheets and PDFs are tough to view on small screens. Imagine pinch-zooming an architectural detail on your phone, or trying to find an email for a specific product order from months ago. Keep a master set of printed drawings, spreadsheets, invoices, and FF&E lists (furniture, fixtures, and equipment) on hand for easy reference, and to save yourself from headaches. Make a point of working closely with the project team, and stay in communication at every stage of the building process. Referring back to your original vision will lessen the chances of any surprises along the way. If you need to make a change halfway through, make sure to everyone knows of the update and get it in writing. Doing so will help you stay in control and to ensure that all team members are on the same page. 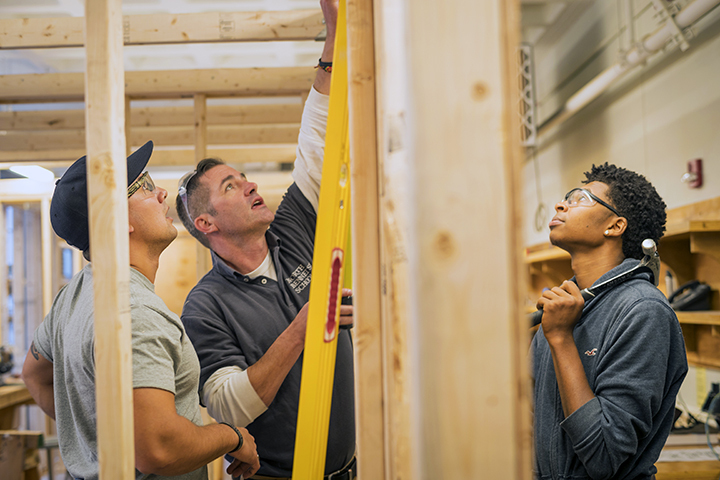 Whether you’re a homeowner remodeling your kitchen or bathroom, or an architect planning a stellar renovation, hiring local, talented craftspeople will make for a successful project. At North Bennet Street School, we train our graduates to produce the highest quality work, and to be committed to excellence in their craft. What’s more, we have a Jobs & Commissions Board, where you can easily find professionals for any project, large or small. With a great team and a solid vision, you’ll be enjoying your project before you know it.